Nine people, including a Lancashire county councillor, have been charged after an anti-fracking protest. 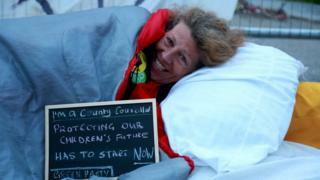 The Green Party's Gina Dowding was one of six women and three men arrested at the Cuadrilla site on Preston New Road on Monday. All have been charged with obstruction of the highway and offences under Section 241 of the 1992 Trade Union and Labour Relations (Consolidation) Act. They are due to appear at Blackpool Magistrates' Court on 7 August. The nine are alleged to have sought to prevent workers from going about their lawful business. A 61-year-old man from Ormskirk, who was also arrested, was given a caution and three other women were reported for summons, Lancashire Police said. The protest was part of a month of action by campaign group Reclaim the Power. A Cuadrilla spokesman said on Monday that the action had not affected any of the work at the site. Update 5 July 2017: This story has been amended to clarify the nature of the charges brought.